Indian Navy's operational strategies received a shot in the arm when Gujarat Chief Minister Anandiben Patel commissioned INS Sardar Patel here on Saturday. INS Sardar Patel will give Indian Navy a huge operational advantage in Gujarat coast. The aim of this new naval base at Porbandar is to beef up security along the 1600 km coastline of the state. It will also increase the maritime security on western coast and strengthen surveillance and security in the region.It is a Forward Operating Base (FOB), located at a crucial strategic position as far as Navy is concerned because this coastal area is close to our western neighbours in Northern Arabian Sea, including along the International Maritime Boundary Line with Pakistan. 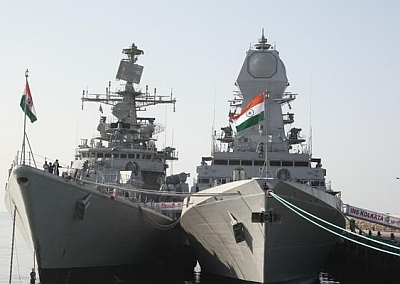 This naval base also will strenghten the maritime security and surveillance operations of Indian Navy as warships or surveillance ships can be mobilised at any time. The newly commissioned naval base is christened after India’s first Home Minister Sardar Vallabhbhai Patel Patel. It is second naval base of Indian Navy on Gujarat coast, the first one is INS Dwarka at Okha in Dwarka district. Gujarat has a coastline of 1600 km interspersed with 43 ports. Of these, besides Kandla being a major port, 11 are intermediate and 31 are minor ports. The ports of Gujarat handle 300 million tons of cargo annually, which is 43% of the total maritime trade handled by the various ports of India. In addition, it will also protect the maritime infrastructure and commercial interests of Gujarat which caters around 70% of the country’s oil and 73% of gas imports through different ports located across the state. The ports of Gujarat also handle 40 to 50% of the total maritime trade handled by the various ports of India.